All prices are in Australian dollars, and are inclusive of GST. You will be prompted to upload all necessary documentation that proves your eligibility for this registration, so please have all documents prepared prior to registering. Payment can only be made by credit card (Visa or Mastercard only) during the registration process. Note that payments will appear as Expert Events on your credit card statement. Cancellations must be advised in writing to the registration secretariat. Registration cancellations received by Wednesday 6 June 2018 will receive a refund of registration fees, less an administrative charge of AUD 110. Registration fees will not be refunded after Wednesday 6 June 2018 unless extenuating circumstances apply and will be at the discretion of the conference committee. Registrations are transferable to a colleague at any time prior to the meeting provided the registration secretariat is advised in writing. 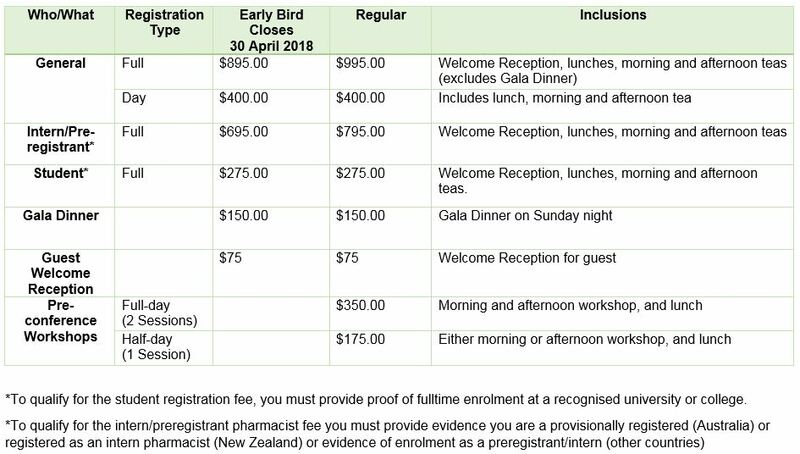 If you are planning to visit Australia to attend our business conference as a participant or attendee, (that is, you will not be working, entertaining, or being paid to contribute), you may be eligible for one of the following Visitor visas: ETA (subclass 601), eVisitor (subclass 651) or Visitor visa (subclass 600) Business stream. Letters of invitation will not be issued for this conference. To assist in obtaining any necessary visas that you may require, it is essential that you complete the online registration form and finalise payment in a timely manner. An official tax invoice and confirmation email will be issued to you which you will be able to submit with your visa application. A registration desk will be located in S block, Gardens Point, QUT, from 8am Friday 6 July 2018. More details TBA soon. A registration desk will then be located on the Podium Floor at the entrance of the Conference Room and Soleil Pool Bar from 6pm Friday 6 July - Monday 9 July 2018.